Newcon Optik offers a very wide range of Night Vision Monoculars from the most affordable battery-free Stargate to the top quality 3rd generation NVS14, and from the smallest Super Mini, which is comparable in size with a regular pen, to large stationary NVS8 with 204 millimeters aperture. 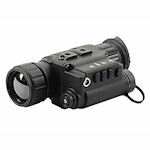 Newcon Night Vision Monoculars series includes representatives from all three generations. All have built-in IR illuminators. Newcon produces thermal imaging monoculars with various objective sizes and resolutions. Most include a 2x/4x digital zoom.